It's no news to anyone that I love jewelry, handbags, fashion and especially an accessory that expresses my personal style, makes a great statement and looks amazing. So it should be no surprise that after I had been to a Stella & Dot trunk shows I was hooked. I picked up the Revival Tassel Necklace (one on right) immediate and two days later it arrived in my mailbox and ten minutes later it was on my neck. I can't wait to get the Awakening Charm Necklace (on left) to wear with the Revival Tassel Necklace. It's a great look without thinking, effortless and is versatile. 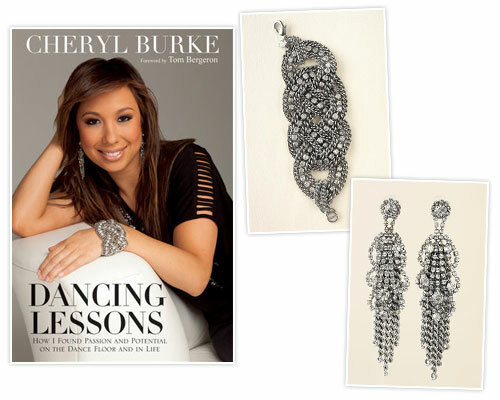 I've worn mine with a brown strapless summer dress, a tank and white shirt with jeans, and some of my favorite linen. 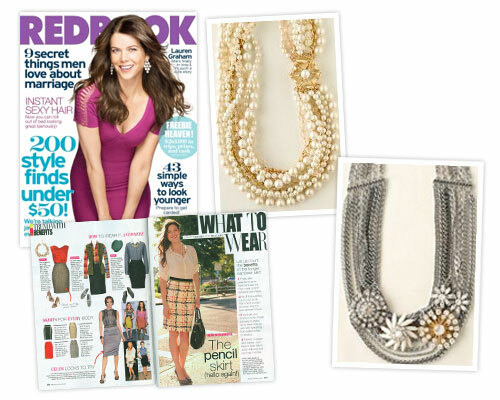 Revival Necklace has been featured in Everyday with Rachael Ray, Instyle and Redbook Magazines. My favorite piece of jewelry to purchase has always been a great bracelet, and this is a great bracelet. The Petra bracelet looks like you need an occasion or night out but that is just not true anymore. I'm going to wear mine whenever and where ever. If your like me if I wait for an occasion or special night out I might never get to wear it, plus look at the Redbook picture, it looks great casual and it's a little unexpected but perfect. Don't be afraid to be bold, and if you are a bracelet is a great piece to start with. Again, like all of the Stella & Dot jewelry the Petra bracelet is versatile and beautiful. If a bold statement is not your style Stella & Dot has the a beautiful selection of delicate pieces. 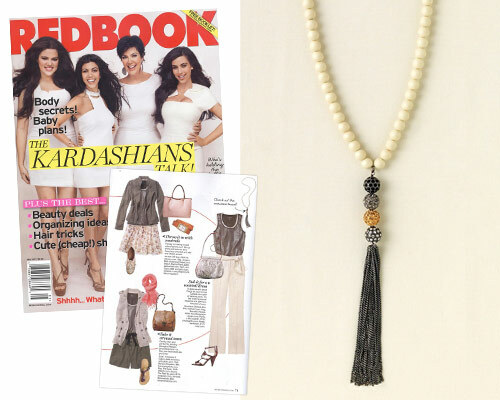 The On The Mark necklace is simple, stylist and People magazine loves it too, as well as the Clover single wrap leather bracelet. ﻿These are all Stella & Dot and look great together or alone. But if you know me I say wear them ALL. I know I've focus on the bold and statement pieces but it's what I'm drawn to so I can't help it. The Metropolitan Mixed Chain Necklace is a calling my name. I recently saw it on a friend with a solid color long sundress and her hair pulled back in a pony, and no other jewelry on and she looked so incredibly put together and polished. It was like see never thought twice and she looked amazing. The Charlotte Statement Necklace (pearl on on top) is also a show stopper and like all of Stella & Dot's jewelry it can be worn with anything (it's on my wish list). We don't have to look like Giuliana Rancic to wear the Metropolitan Mixed Chain Necklace but I wanted to everyone to see how a easy it can be to wear. Plus if Giuliana Rancic loves it how can I ignore that, no wayyyyyyyyyyyyyyyyyyyyy!!!! She has an impressive style sense. If you are inspired by style and want to add a bold statement to your jewelry wardrobe or would rather add delicate, understated pieces, Stella & Dot is the answer and I am the girl to help you. Host a trunk show and you can easily earn $250 in free jewelry and an additional four pieces at half price. Call me, text, email or facebook.